An incredibly interesting and very poisonous plant is Cholchicum autumnale in the family Cholchicaceae and order Liliales. It is better known as autumn crocus and meadow saffron. The flowers appear in autumn, whereas the foliage follows months later in spring the following year. 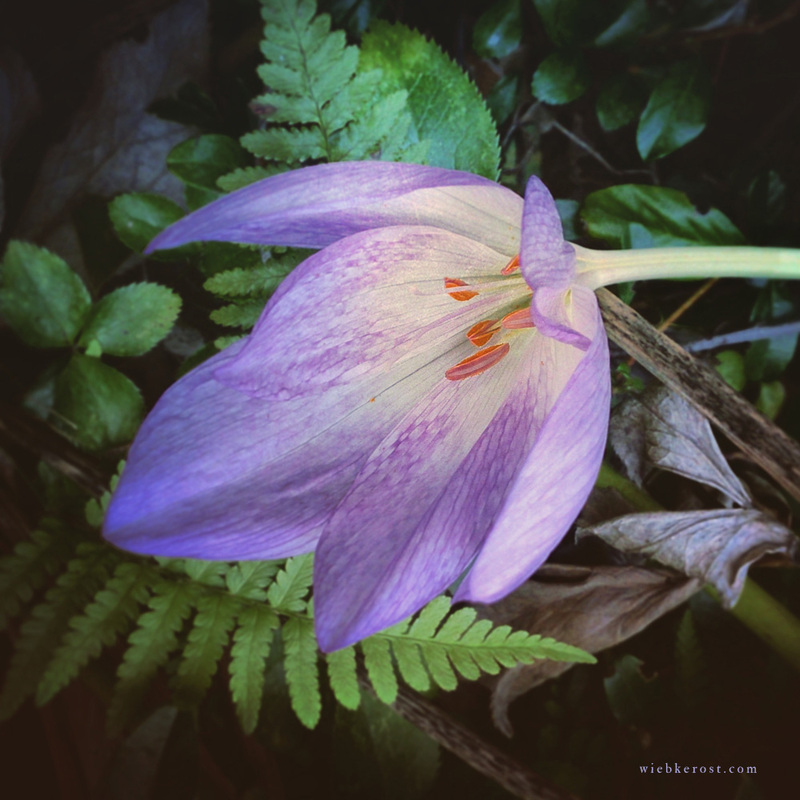 You may find yourself wondering what those long lily like leaves void of any inflorescence are doing in your garden, only to find yourself wondering again, right at the beginning of fall, where all of a sudden these beautiful purple to pale pink, crocus-like flowers come from. The flowers belong to those leaves you had spotted months earlier and had probably long forgotten about. Another name for this wondrous plant is hence naked lady, because the flowers appear all barren. But there is more to this. The ovaries of the autumn crocus are located deep in the ground. Due to this the flowers possess extremely long styles, often 10 cm or longer. What looks like a stem are in fact the tepals joined into a long tube and enclosing the prolonged, pale white styles. Each flower possesses three such styles, which remain free and unattached all the way to the ground. The flowers attract pollinators such as bees and flies. They are hermaphroditic and self-fertile. The capsular fruit emerges in late spring together with the foliage. The ripe capsule is brown and swollen. It contains the small black-brown seeds, which possess white elaiosomes, literally “oil bodies”. These oil bodies attract ants, which then carry the seeds away and thus help the plant spread. (Other plants possessing such elaiosomes are e.g. Chelidonium maius, Helleborus and Sanguinaria canadensis.) Besides this the seeds are also spread by wind. During the winter time all vital parts of the plant remain underground. (Such plants are called geophytes.) The old corm dies whilst a new one emerges. At the same time a lateral offspring develops into a second corm. The corms are brown and scaly, measuring 2,5 to 5 cm in diameter and up to 7 cm in length. The German name Herbstzeitlose translates as “autumn time-less”; however, the name actually expresses a slightly different meaning, since “lose” derives from an old German word for divining or foretelling, hence “messenger of autumn” would be more correct. 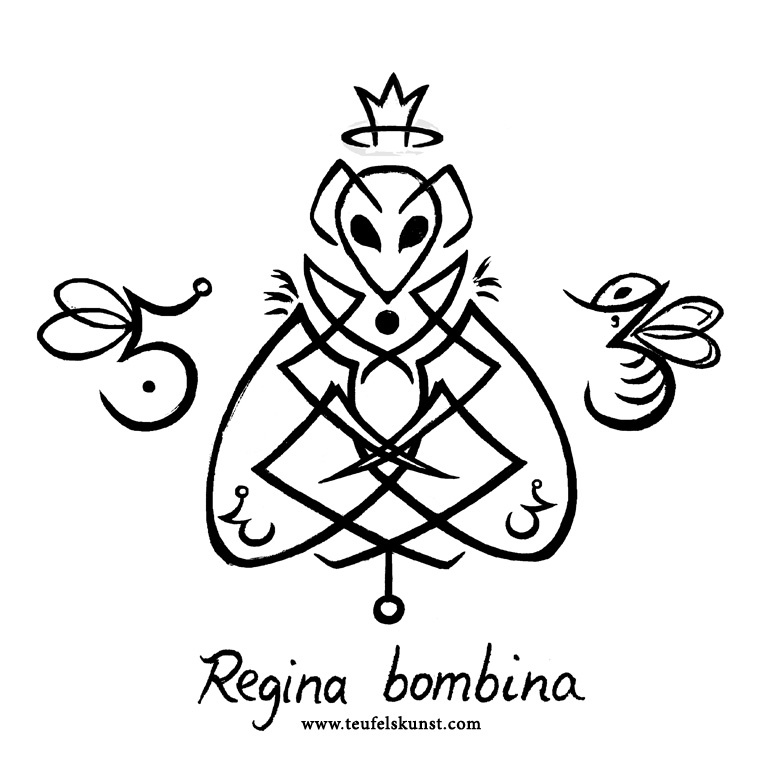 (And it’s quite a beautiful name too.) 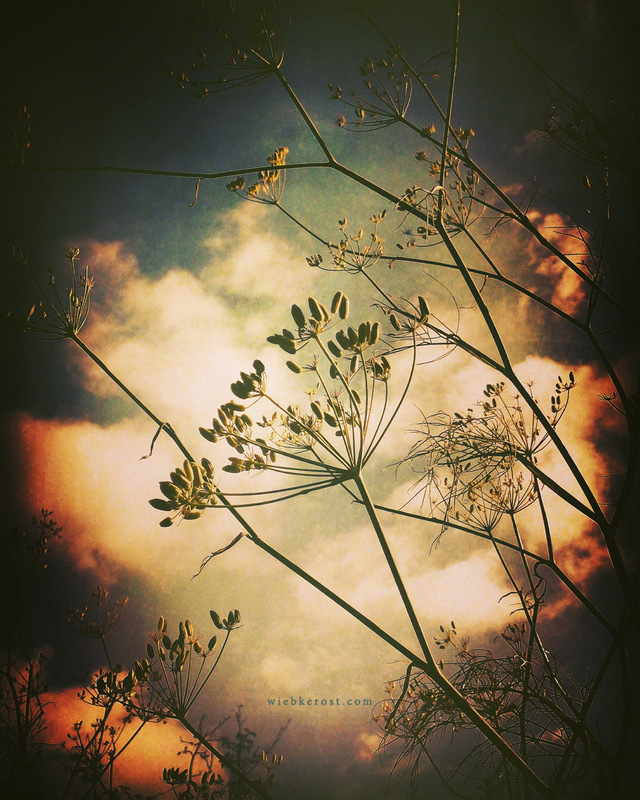 Other German folk names include Nacket Huren (“naked whore”), Herbstvergessene (“autumn forgotten”), Zeitlose (“timeless”), Herbstlilie (“autumn lily”), Wintersafran (“winter saffron”), Michelsblume (“Michael’s flower”), Winterhauch (“winter breath”), Leichenblume (“corpse flower”) and Teufelsbrot (“devil’s bread”). 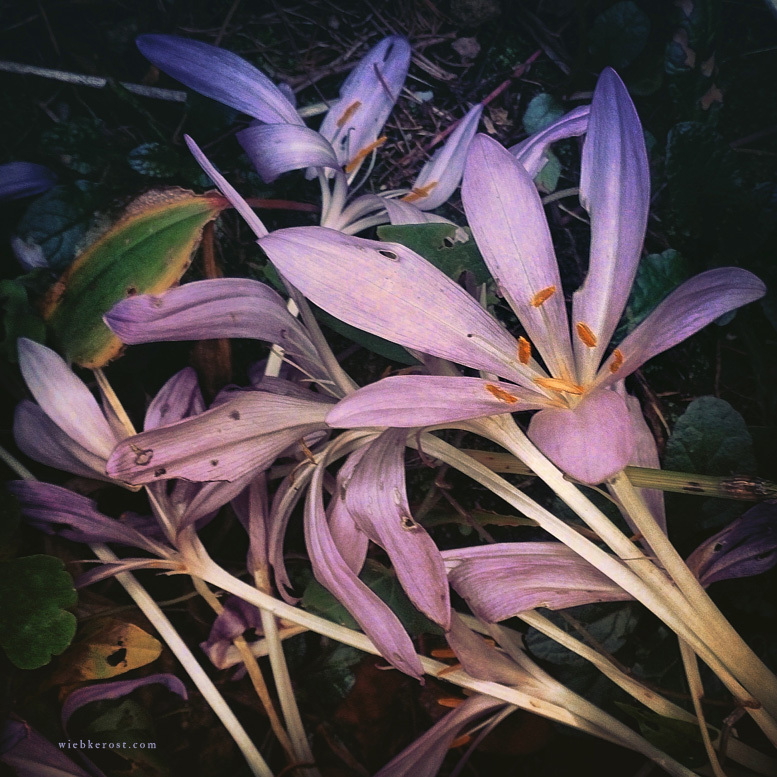 Fading flowers of Colchicum autumnale. Wild Colchicums are said to contain more poison than cultivated forms. Dioscorides first mentioned a plant by the name Colchicum variegatum. The specific name autumnale refers to the time of flowering. The genus name Colchicum is derived from Colchis, the landscape on the Black Sea, most famously known for the witch Medea, who is told to have poisoned her enemies with the plant, but also restored youth with its help. In Apollonius Rhodius’ Argonautica, Medea rubs a salve on Jason’s limbs, which may have contained Colchicum. It is said this plant grew from the blood that tormented Prometheus spilled over the land, when the eagle picked his liver. However, the very same story is also often related to the Mandrake. Either way, meadow saffron has been used medicinally for at least 3500 years. It is still a treatment for rheumatism and gout. Due to its high toxicity it has also a long history of abuse in murder as well as suicide. The roots maintain their colchicine content for months and could be shipped around the globe as a raw medicine. The root or bulb was tied as an amulet around the neck during the times of the black death. The witch Medea allegedly used Colchicum in poison murder but also to restore youth. Colchicum has been mistaken for bear’s garlic (Allium ursinum) by foragers. The corms, leaves and seeds contain the poisonous alkaloid colchicine, which is a mitotic poison (it interferes with the reduction division of the chromosomes during meiosis). It acts similar to arsenic, with no known antidote. Long latency period and lack of antidote make diagnosis and appropriate treatment difficult. In suspected case of poisoning call emergency immediately (in Germany contact your nearest poison control center = Giftnotruf). Symptoms of poisoning occur within 2-6 hours and consist of: burning sensation in the mouth and throat, vomiting, spasms, diarrhea (containing blood), circulatory insufficiency, lowered body temperature and blood pressure. After 1-2 days death sets in through respiratory paralysis. The patient stays conscious until the end. Colchicine is a useful drug with a narrow therapeutic index. It is used for treating gout and familial Mediterranean fever. A synthetic compound similar to Colchicine is used in the development of a medicament for the treatment of some types of cancer. Colchicine’s mitose interrupting properties are made use of in plant breeding to achieve larger plants and fruits: it stops plant cells from dividing. As a result haploid cells become polyploid and larger then usual. The autumn crocus is native to Southern Europe and Asia. It grows on moist meadows and pastures. 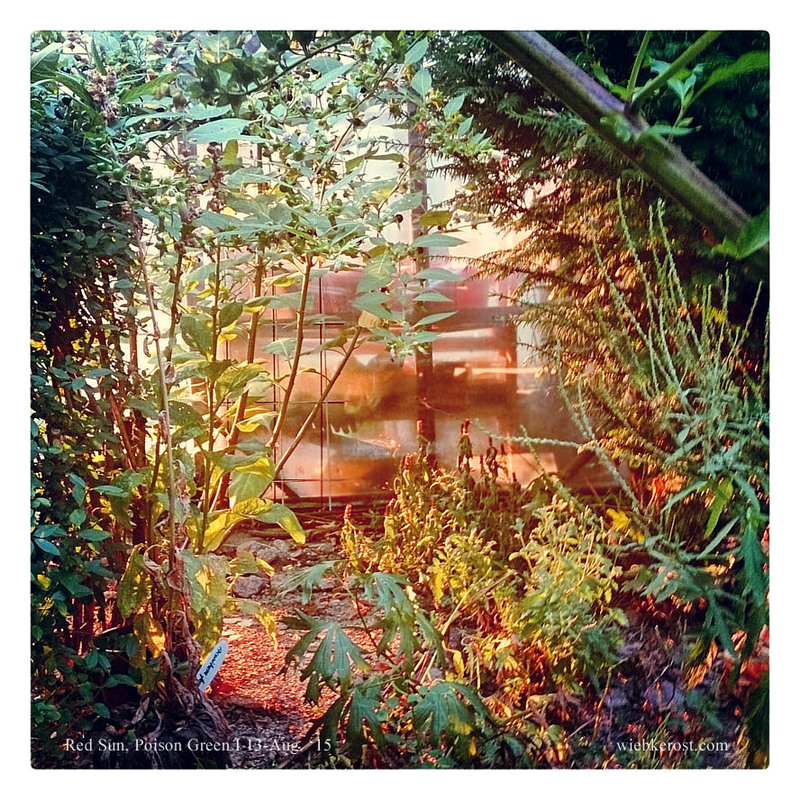 In the garden it likes a spot in full sun or half shade. 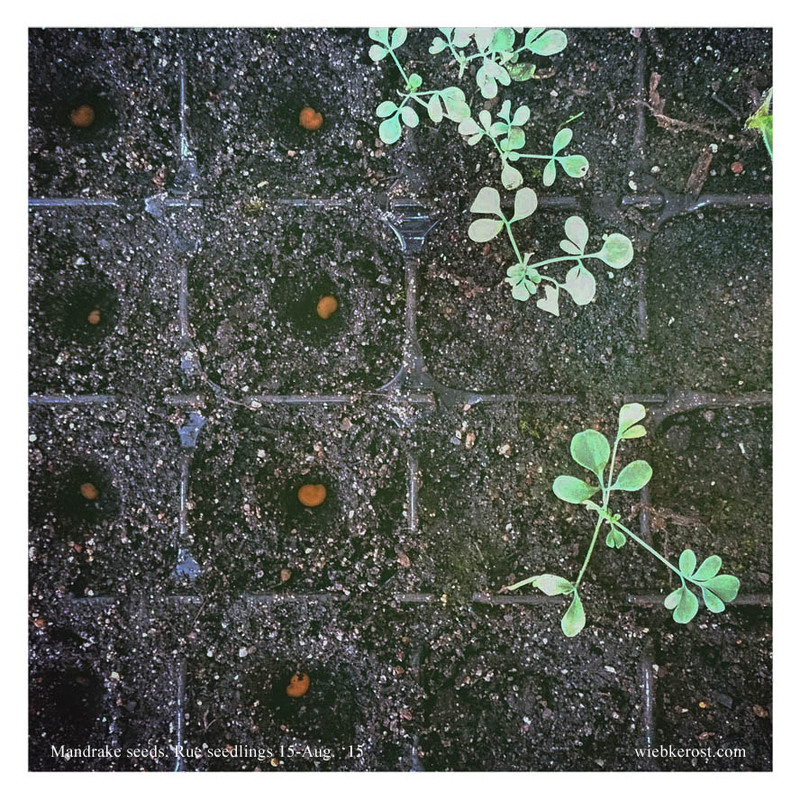 The soil should be fertile, well-drained and hold moisture. Plant the corms in late summer or autumn, ca. 8-10 cm deep. The foliage requires space, hence plant about 20 cm apart. 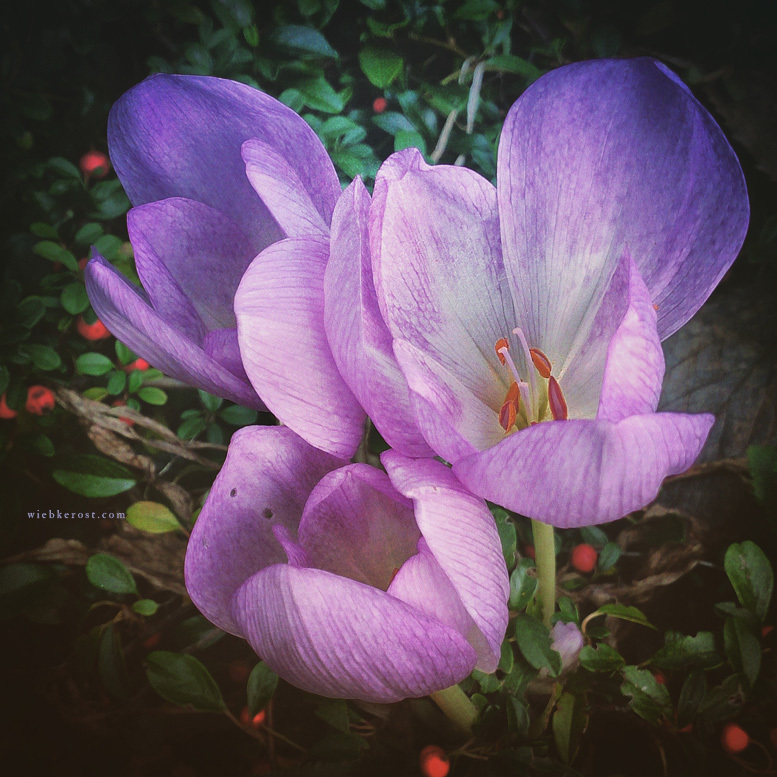 Autumn crocus spreads readily through its corms, to a lesser extent also through seed. The plant is hardy and takes care of itself and basically needs no care. After some years they will form dense clusters. Dig out the corms in midsummer (when the foliage has died back), separate and replant directly. This way new plants can be obtained easily. Make sure to wear gloves when handling. The original paintings are done with plant juices and blood. The images are ca. 110 x 150 mm, the paper format is A5. Protected inside simple black carton and envelope. Each print is signed and numbered. Available are 10 copies of each. Today I have sown the remainder of the mandrake seeds, which had been primed months ago. They were kept in wet paper towels and placed in the fridge for weeks, then taken out and placed in fresh wet paper towels. I’ve been hoping for them to germinate but thus far no sign of life. Yesterday I took them out, cleaned them (all seeds sunk in water, which is a sign they are still viable) and placed in soil today. In addition I have sown the same amount of unprimed mandrake seeds for comparison. I have one tray on my window bench at room temperature, but may move it to the basement, where it has cooler temps. The other tray is in the green-house. Besides Mandrake I have also sown biennial henbane (Hyoscyamus niger) from fresh ripe seeds. 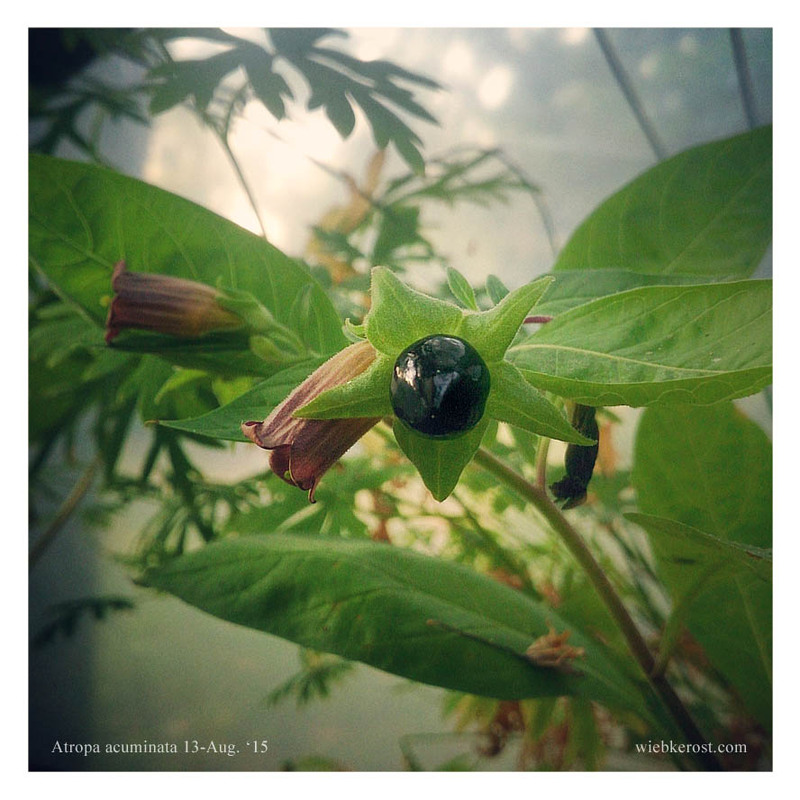 Last evening both my “black datura” as well as toloache opened their first flowers for this years. 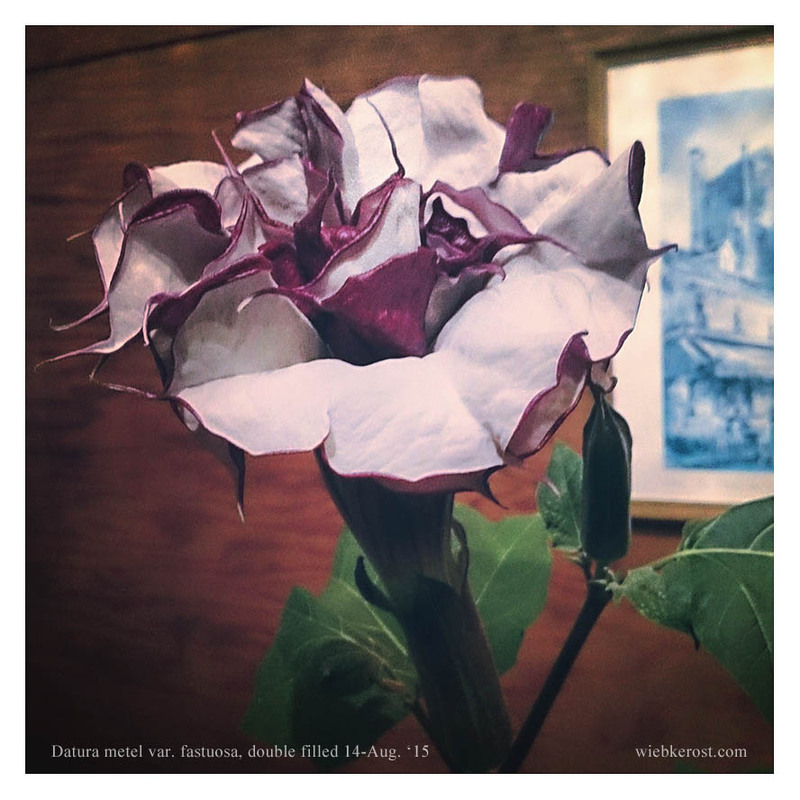 The black devil’s trumpet (Datura metel var. fastuosa) is grown from seeds from Malta and has really big, double filled flowers, which smell absolutely enchanting. 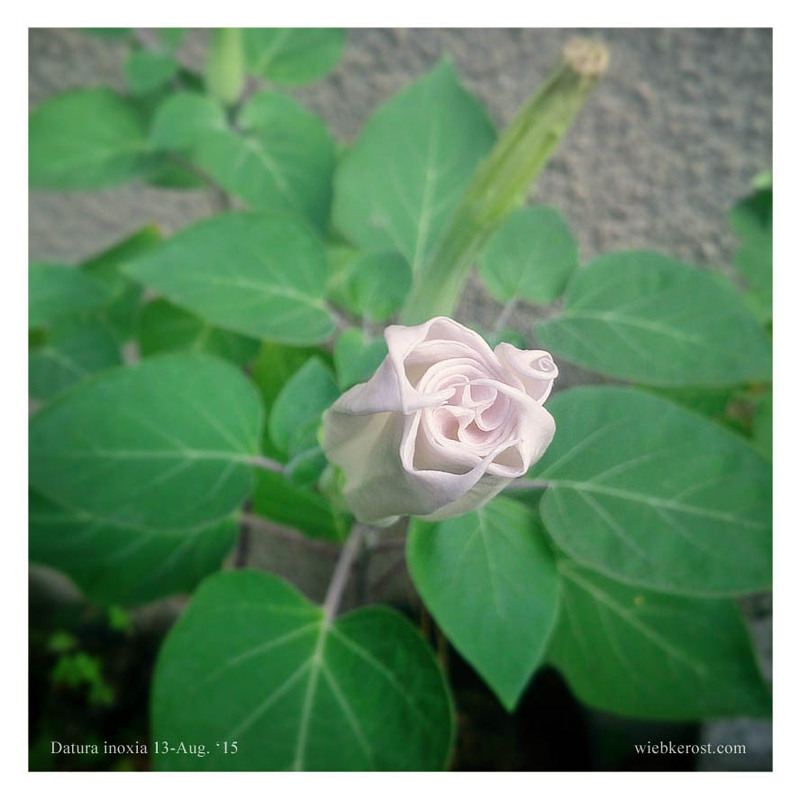 There goes the beautiful “moon flower” (Datura inoxia), flower about to open. Comes back year after year, always a sweet joy. A fine addition: Indian Belladonna (Atropa acuminata) has slightly smaller, more cone like and edged fruits compared to her European sister. Flowers are a touch darker, velvet brownish purple. Grown from seed. I’m happy to have this lovely sister of the native deadly nightshade. 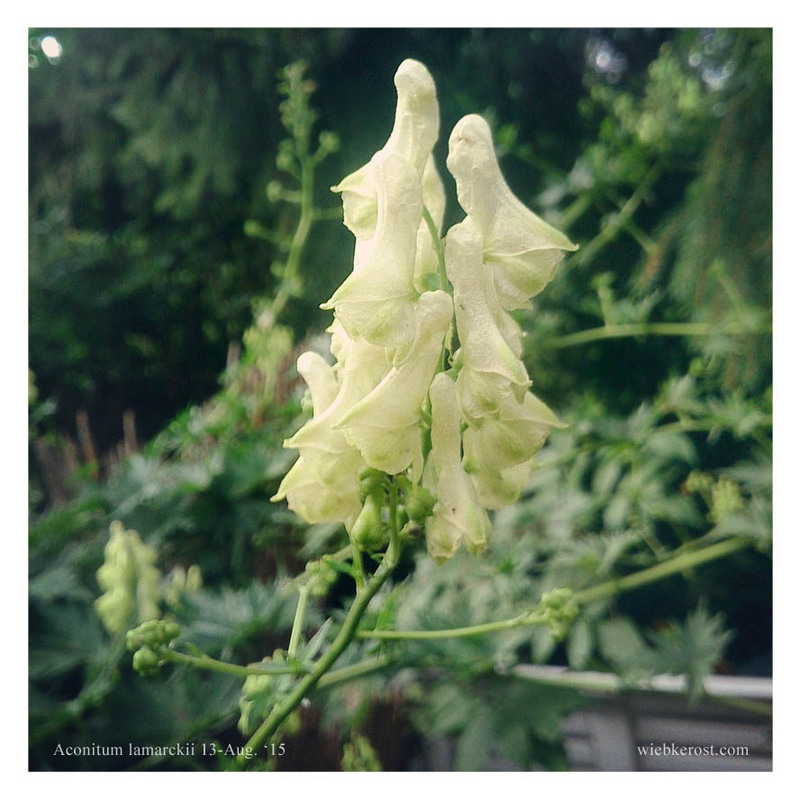 One of my favorite ‘ghost’ flowers: Yellow Monkshood (Aconitum lamarckii), returns every year and makes for a nice contrast beside the Blue Monkshood (Aconitum napellus), both of which are in bloom now. 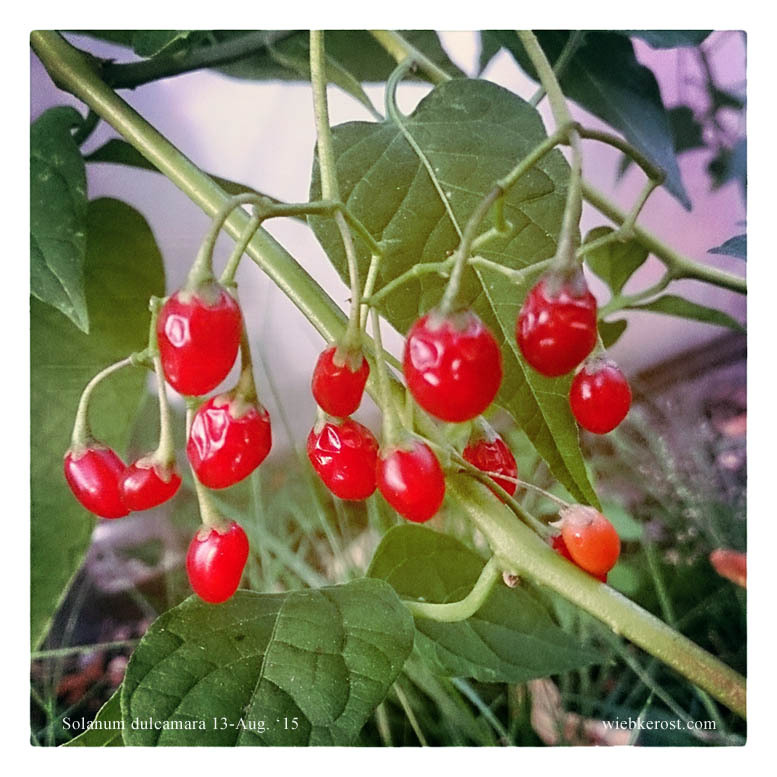 The bright red berries of Bittersweet Nightshade (Solanum dulcamara) are tempting to taste, but poisonous! They still make a beautiful contrast to the pale yellow flowers of Aconite etc. The stems contain cortisone-like substances and are used in herbal medicine. They are harvested in autumn or spring. 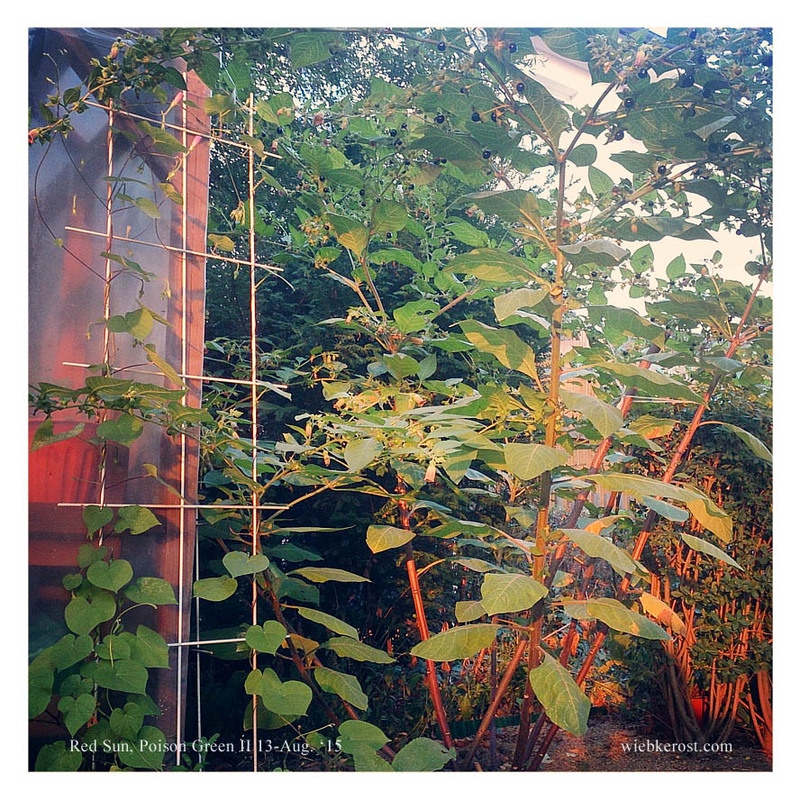 As the sun sets and bathes the poison green in red, the day in the garden ends. I started my work at noon and finished at dusk. It felt like only a second had passed.